The best of the year's brightest ideas for enhancing wind energy. This groundbreaking concept turns a conventional low-carbon wind turbine (with a typical carbon footprint of around 4g of CO2/kWh) into a "climate positive" machine. This is achieved by boosting turbine performance and efficiently removing CO2 from ambient air. The stored CO2 can be converted into natural gas via power-to-gas, or liquid synthetic fuels, such as e-diesel, by adding a Fischer-Tropsch reactor. One state-of-the-art 4MW Blancair-designed turbine could "remove" around 100 tonnes of CO2 a year, roughly the annual absorption of an 80,000m2 forest. The main operating principle is that a mass of air inside the rotor blades is pulled out by centrifugal force through tip openings, creating outward airflow and an air pressure difference inside the rotor hub. This allows sucking ambient air through a CO2-separation filter. Air — without CO2 — is then led through a dehumidifier and desalting unit, a fully passive system that eliminates the need for electric pumps or cooling fans. Generator heat is reused to optimise CO2 separation and the dehumidifier/desalting processes by creating optimal operating temperatures. A smaller heat proportion in the airflow protects sensitive nacelle internals against corrosion and premature failures. 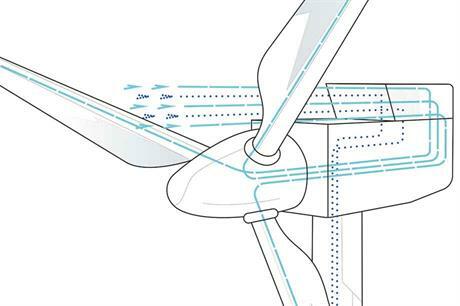 Inside the blades, dried air counteracts composite degradation by avoiding water vapour to settle at exposed surfaces. Airflow acceleration losses are compensated for by a dedicated blade tip design with aerodynamically optimised outflow. Reduced tip vortices offer positive aerodynamic performance effects, comparable to winglets, for a calculated overall net positive total system efficiency. The next envisaged step is a full-scale prototype turbine that incorporates all the Blancair elements.